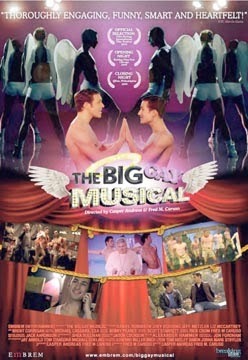 The Big Gay Musical is a 2009 gay-themed musical-comedy film written by Fred M. Caruso and co-directed by Caruso and Casper Andreas. The film follows a brief period in the lives of two young actors, one who is openly gay, the other closeted to his parents. The openly gay actor struggles with whether he should be sexually promiscuous or seek a life partner, while the closeted one wonders if he should come out to his conservative, religious parents. Throughout the film, there are a series of musical numbers with tap dancing angels, a re-telling of the Genesis story, protests from televangelists, a deprogramming camp that tries to turn gay kids straight. By the end of the film, the characters realize that life would be better if they just accepted themselves the way they are.